Daily Dose: Priests, "Good Time Charlie"
Wednesday, Washington, D.C.’s Priests shared “Good Time Charlie,” a pointed take on America’s glorification of violence. The rumbling and—dare we say it—explosive single is the second off their forthcoming album The Seduction of Kansas. Frontwoman Katie Alice Greer, guitarist G.L. Jaguar and drummer Daniele Daniele explore our collective construct of America on the new record, out via Sister Polygon Records on April 5. Their first single from the album, the eponymous “The Seduction of Kansas,” looks at American culture’s warped relationship with its own image. This newest track instead focuses on Charlie Wilson (yes, that Charlie Wilson) and how his involvement in Operation Cyclone was yet another iteration of the West’s proliferation of violence. It’s a heavy topic delivered with a heavy sound, yet Priests still manage to make the song a rollicking good time for all of us, not just Charlie. I like to think of this song a little bit like the Gilligan’s Island theme song, but for a Hollywood tale of Charlie Wilson. It’s also a little bit about 9/11 but much like Otessa Moshfegh’s My Year Of Rest And Relaxation, the character sketch is more drawn out in its absence rather than presence. I saw a documentary about the history of the United States’ relationship with the Middle East, and there was clip of an ‘80s lady who looked a little like Vanna White (who turned out to be Joanne Herring) saying how she wanted to get the Mujahadeen guns to fight the communists because she believed they worshipped the same god as her. So I got curious about how this story unfolded, but even more so, how the tale has been told in western culture. I watched the movie Charlie Wilson’s War and it was so unintentionally funny the way they told this story, like think of the movie Team America, except the filmmakers weren’t joking (at least I don’t think). And then I read in the film’s Wikipedia page: “The film’s happy ending came about because Tom Hanks ‘just can’t deal with this 9/11 thing.’” I don’t know why exactly but this got stuck in my head and made my brain feel like it was exploding. So, with Daniele and GL and Janel Leppin on bass, we made it into a song. Hope you like it! 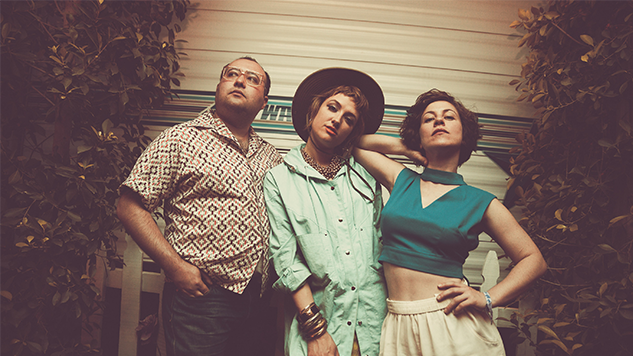 Priests’ efforts on the record were rounded out by Leppin, their primary bassist and previous collaborator on Nothing Feels Natural, and producer John Congleton. Congleton, who’s previously worked with Angel Olsen and St. Vincent, recorded the rock trio at his Elmwood Studio in Dallas over the course of two weeks. Watch the lyric video for “Good Time Charlie” below, check out Priests’ upcoming tour dates here and get to know the politically minded band better by revisiting Paste’s 2017 feature on Priests.